Little by little the jewels of Fuerteventura’s gastronomy are being discovered and more and more people praise the quality of its raw material. Fuerteventura’s landscape has the usual presence of its famous goat and its shores are lapped by clear waters of great purity. 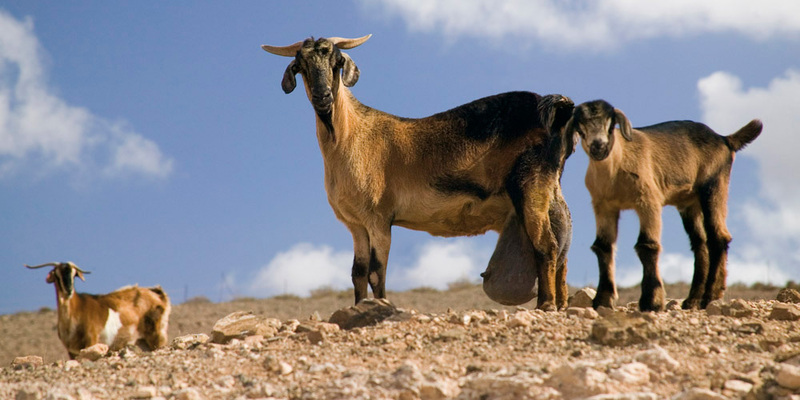 Goats and saltwater are its most representative elements and, as it couldn’t be otherwise, those which make Fuerteventura excel in the gourmet world. The dense, fat and aromatic milk got from the healthy and happy “majorera” goats is the basis for the tasty and varied “Majorero” goat cheese, a fatty cheese which has an intense aroma, with different tastes for the palate depending on ripening and on what ingredients it has been cured in (oil, gofio, paprika …). One of the secrets of the quality of this product is its naturalness, since most of the goats bred on the island are free of impurities, drugs and other harmful substances. 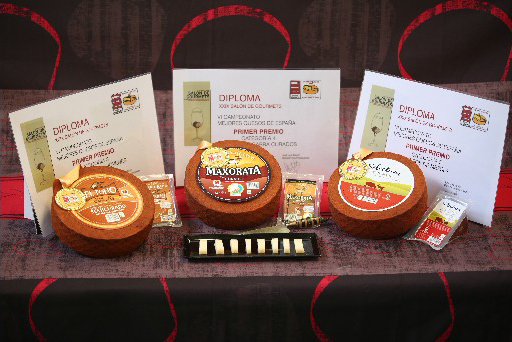 The “Majorero” Goat Cheese has had denomination of origin since February 16th , 1996, and it has won countless awards since; the last ones, three gold medals, in mid-April 2015, in “El Salón del Gourmet” in Madrid, which has chosen three “majorero” cheeses among the best in Spain: The brand Tofio (semi-cured with paprika) Selectum ( mixed cow-goat milk) and Maxorata (cured with paprika). 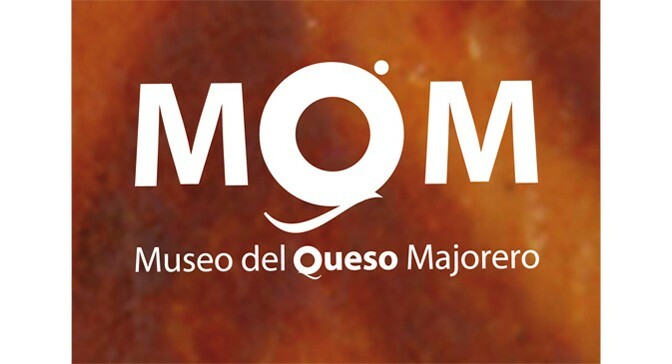 We recommend visiting the “majorero” Museum of Cheese, in the Visitor Center in “El Molino de Antigua”, which you can visit Tuesday to Saturday, 10am to 18pm. Information: Tel. 928 878 041. 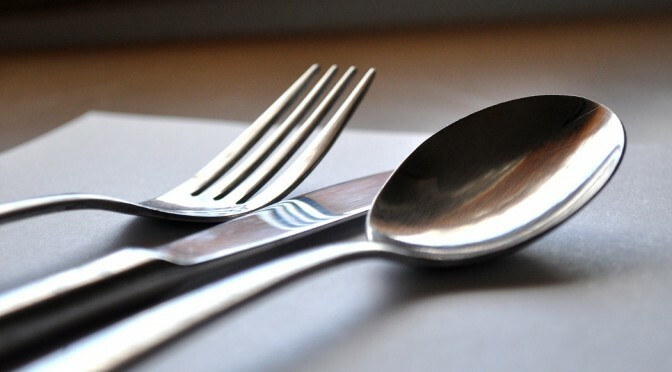 As we have already told in a previous article of this blog, the “majorera” Foam Salt has also been recognized as a “majorero” gourmet product that, for some years, has been internationally well known because of its properties. What is special about this foam salt is its fine grain and smooth taste on the palate, and its crystallization in the form of flakes. “Majorera” Foam Salt is obtained from the surface of the sea, not from water brought from the seabed through pipelines, but the sea foam that breaks on salteries and goes directly into the cookers (where the water evaporates), hence its highest quality. 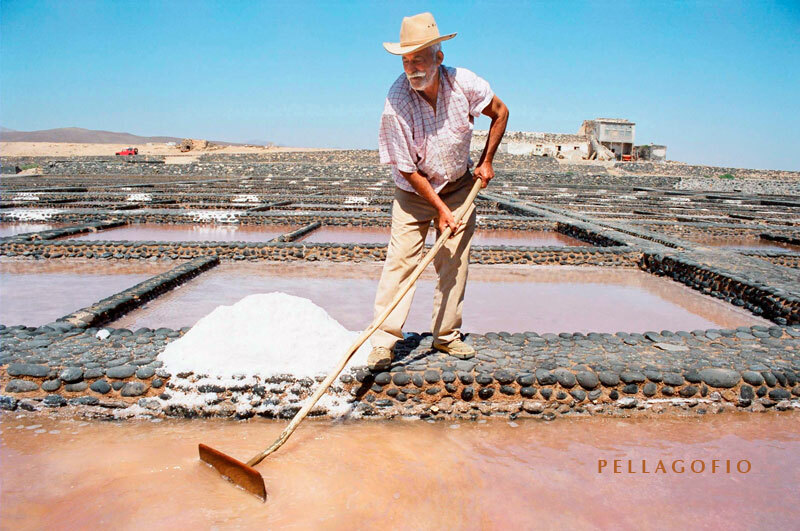 If you have not yet visited the Interpretation Center in Las Salinas del Carmen, we recommend you to get the opportunity to witness, first-hand, the artisan craft of obtaining foam salt, Tuesday to Saturday, 10 to 18h. Information: Tel. 928 174 926. 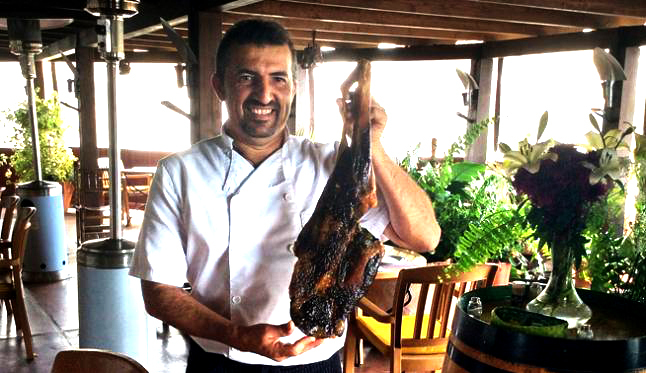 To savor this majorero gourmet product we must go to Casa Marcos restaurant in Villaverde, where Marcos Gutierrez, well-known majorero chef, has been experimenting on “majorera” goat legs for over 10 years. Marcos calls it “cecineta” (dried beef-bacon) and he has managed to work this product thanks to popular lore handed down from generation to generation, since in ancient times goat meat was cured with salt to preserve it. The freedom of “Majorera” goats and their feeding on dry grass makes its taste softer than that of goats elsewhere, so the taste of “majorera” goat ham is a delicacy for the palate. At the moment, Marcos isn’t considering export, but who knows in the future. Many say it would be a great product in the Muslim world, where they can’t eat pork. From July 24th 2014, Fuerteventura has a Monographic Museum of majorero cheese. This cheese got its designation of origin on February 16th 1996, and since then it has become one attraction in Fuerteventura due to its first rate quality. The inauguration of the museum took place in the Visitors’ centre, in the mill of Antigua, where the premises of this museum are. The aim of the Majorero cheese Museum is to show the value of the livestock culture in Fuerteventura, associated with the goat and cheese, and its promotion as a tourist attraction. The Majorero cheese Museum has a true didactic purpose where several rooms are distributed along the 515m2 they take up. They are classified into different topics and functional areas where they tell the two-thousand-year history this island has devoted to raise goats. – In one of the information areas they speak just about Fuerteventura, characteristics of the island, its weather, fauna and flora, its orography and geology. – And lastly, there is a tasting room and Fuerteventura cheese shop so the visitor can, apart from knowing the history of this product, taste it and make a personal evaluation. In the surroundings of the museum we also find the mill of Antigua, declared an asset of cultural interest in the monument category in 1994, and the restaurant, which will shortly be out to tender. In our private boat trips or two-day charters Fuertecharter never forgets the Majorero cheese, as an added value, to offer our clients the tasting of one of the best products in our land. Last April 5th the project for the expansion of Corralejo’s Harbour was presented in the Municipal Auditorium. According to the statistics of the Canary Island Government, this harbour gets the largest number of visitors in all the islands, even outnumbering those in Playa Blanca, Morro Jable and Agaete. The conditions of this harbour at present do not fulfill the present demand, as there isn’t enough room for all the boats that need it —there is a long waiting list of boats looking for berth—, it lacks appropriate lighting and a petrol station where boats can refuel, with all the risks that transporting jerry cans with fuel entails. Moreover, it doesn’t count on a dry-dock to clean and repair the boats. It seems that all these deficiencies will be sorted out by the implementation of this project by the “Plan de puertos de la Comunidad Autónoma”, which represents a running cost of 40 million Euros and that the Canary Island Government has declared as of exceptional public interest. The aim is to provide Corralejo with a large berth marina living up to expectations, so that water and leisure activities can be enhanced, such as boat trips to Lanzarote or to the islet of Lobos, while modernizing the facilities for traditional fisheries. All this will mean a new attraction to some visitors looking for a different tourism —such as water tourism— instead of the mass sun and beach tourism. Among the reforms to be implemented at Corralejo’s Harbour we must highlight the restoration of berths for the ships that communicate our island to the neighbour Lanzarote (Playa Blanca) and also very important to highlight the creation of a new additional marina, which will be located to the North of the present harbour. The environmental impact assessment has taken particular care of the design of the new dock so as not to interfere with the wonderful views of the islet of Lobos and Lanzarote, paying maximum respect for the surrounding landscape. The expansion, in figures, will mean 38.900m2 of earth surface, that added to the existing ones will become 68.900m2, and the expansion in the surface of sheltered water will reach 68.900m2, 14.000m2 of which will be developed as commercial harbour, 55.700m2 as marina (with 767 berths) and 125.000m2 as outer dock. The license of the petrol station has been awarded, for 15 years, to Domofuture Green Alliance, which will need an estimated capital outlay of 750.000€ and will have to supply fuel to fishermen at subsidised prices plus one cent, and to recreational boats at the stipulated price by the “Ley de Tasas del Gobierno de Canarias” plus two cents of Euro. This project was registered by the Ministry of Agriculture, Food and Environment on 12th August 2013, after being approved in the environmental impact statement on the 27th May by the Commission on Land management and Environment in the Canary Islands— a long process whose study considered 15 different alternatives and institutional environmental queries—and it was drawn up by the consulting company Viatrio Ingenieros S.L. Right now it’s awaiting to be passed and assigned in the Matitine-Terrestrial public Domain. Fuerteventura has been nominated by TripAdvisor, the largest internet portal specialised in tourism, as the best island in Spain, followed by Lanzarote, for the “Travellers Choice 2014” awards. Also, the same internet portal awarded Cofete Beach, in the south of the island, the fifth position among the best Spanish beaches; El Cotillo beach, in the municipality of La Oliva, was awarded the 10th position. If we bear in mind that a few months ago the prizes awarded by this portal have placed Corralejo as the leading emergent tourist destination in Europe, and that El Cotillo has reached the fourth position in Spain we don’t have but to congratulate ourselves, the majorero land and its residents, who make these realities possible by treating tourists well. These awards are the result of the tourists’ opinions and the comments and ratings they leave about their experiences. In Fuertecharter we try to contribute in so far as we are actually able so that our visitors are satisfied, and our boat trips from Corralejo always get excellent comments and ratings in TripAdvisor. These ratings that our island is getting place us in a very good position we must keep and improve if possible. The studies reflect in their data a leading position of Spain as far as tourism is concerned, whose activity accounts for over 10% GDP, creates the 11% of job positions and offsets to a great extent our trade deficit. In The Canary Islands those percentages are much larger, as tourism is the main industry. a) Order and regulate, within sustainable parameters, the increase of the tourist demand, linked to the improvement of the existing tourist centres and the introduction of new additional facilities. b) Improve the quality and standard of the tourist accommodation and additional facilities. c) Avoid and, where appropriate, redirect the building in tourist areas. d) To provide the administration with effective legal tools to encourage and, where appropriate, ensure compliance with conservation and restoration measures, and the effective use of tourist establishments. e) To improve the image of consolidated tourist centres, and achieve satisfactory public services. f) To encourage coordinated management of public administrations and to speed up the processing of tourist redevelopment projects. With these measures and keeping treating visitors with kid gloves no doubt Fuerteventura will keep and even improve these data launched by TripAdvisor. We’ll keep doing our bit with our wonderful trips from Corralejo. We keep gathering as much information as possible about the Grey Pilot Whale that was found at Lobos coast last Monday. With this purpose we talked to Marisa Tejedor, from SECAC (society for the study of cetaceans in the Canarian archipelago), who offered us a beautiful and reassuring speech about this topic. Marisa says that although they are all wild guesses, as it’s very difficult to foretell why the whale is alone, we mustn’t panic as the whale is in a deep enough area to move (5mts) and even can leave whenever it chooses to; it is also in an octopus area, its favourite food, so it can feed and the conditions seem to be al-right. The whale has chosen to be there, maybe because it feels ill and it wants to reach the coast to spend its last days; maybe because it went astray and is trying to communicate, as the only anomalous datum is that it repeats very often the facing down movement, surfacing the tail, a characteristic movement of this species when trying to communicate. As she says, it is anomalous to an extent, but it’s difficult to foretell, and the rest of information they get daily about the evolution of the whale is reassuring up to now, they have even seen videos where the whale is playing with a bag. 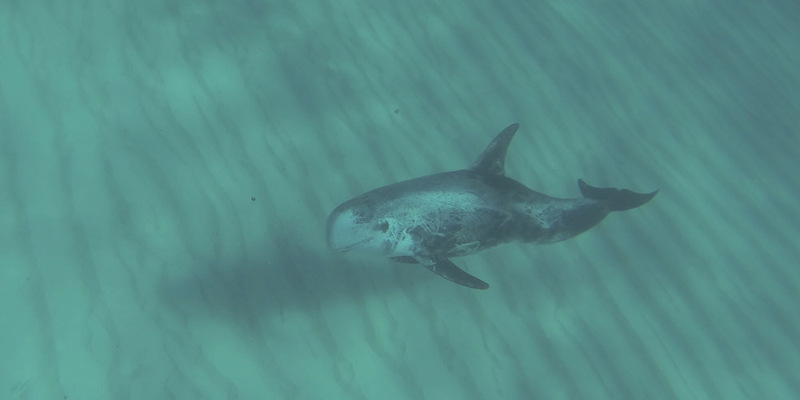 It is clear that it is an adult specimen, and the target is to determine if this grey pilot whale belongs to this area; this can be found out thanks to some pictures they have taken of its dorsal fins, which in this species and in not young specimens dorsal fins are like finger prints, there aren’t two of them which look the same. With this they’ll be able to determine if this whale is living in the Canarian archipelago or in this area. It’s difficult to foretell what will become of it; besides, these days the sea is not in good conditions to make further studies. Even so, the grey pilot whale is visited daily by the captains of the trip boats and by Environment, which get enough information to be reassured that the whale is al-right up to now. Marisa Tejedor thanks the captains sailing in this area for safeguarding the distances stipulated by the law and for trying to protect the whale by warning all those who don’t keep them, which is very positive and a reason to be thankful for, as the most important of all is not to disturb the whale. In conclusion, don’t panic, it could leave any time, the daily news are reassuring, the grey pilot whale is in its habitat and home. They’ll keep researching and looking up information that will allow them to get to know better this specimen and its species. There is a certain social concern lately, due to several news informing about dead cetaceans found at different spots in the Canary Islands, many of them attributed to prospecting and military practices. Marisa tells us that these deaths are nothing to worry about, they are within the average rate, it happens every year, mainly at this time, when the fish that emigrate are the food of these huge cetaceans: “Up to now everything is going its normal course, and these deaths are due to natural causes”; on the contrary, this means environmental diversity, as there are 30 different species out of the 86 cetacean species that exist, that is, a 40% ( a high presence of big predators, not usual in many areas), a very important datum and representative of the quality of our waters, which provide nutrients, meaning of life. Another heartening datum regarding petroleum is that they are trying to have this area between Lanzarote and Fuerteventura recognised by Europe, once and for all, as Community Interest Area, a hallmark which would grant us full protection. From Fuertecharter we also thank and ask the captains of trip boats and the public in general to respect this whale, which is at home. We can enjoy its presence and beauty without disturbing it: we are living in its paradise. Next Monday, March 24th, the third “Lighthouse Triathlon”,as it is already known by the regulars of this event, will take place, organized by the hotel complex Playitas Resort. La swimming trial will consist of 1,5km that triathletes will have to swim in Las Playitas, and this trial will be the starting point of this event at 8h in the morning. Then they will have to face 40km cycling, a harder trial this year as compared to the 35 kms in previous events. The itinerary of this trial will take place around areas in the municipality of Tuineje, such as Las Casitas, Juan Gopar… and this will be followed by the 13km running, which will culminate climbing “La Entallada” Lighthouse, a beautiful enclave in the South of our island with breathtaking sea views, the best place to close this event. Among the event’s updates, we must highlight the introduction of this event in “Series Canarias de Triathlon” which makes up “La Copa de la Federación Canaria”. International athletes, such as Anja Beranek and Konstantin Bachor, champions in the female trial in 2012 and male trial in 2013 respectively, or such as Víctor del Corral, champion in the male category in 2012 will take part in this event too, trying to ratify their awards in an event that this year foresees an increase in the number of participants. On the other hand, the team category is also pushing hard, and up to now the Calima Triathlon and the Triscan Clubs will take part in this event with a high number of participants. The target of “La Entallada” Lighthouse Triathlon is to attract as many triathletes as possible to this event, residents and visitors alike, in our island’s attempt to go on with the tourist and sporting promotion that has been carried out up to now. Fuerteventura is an unbeatable place for the practice of several sports and disciplines, either water or land activities, but we also applaud this kind of initiatives promoting healthy tourism, in harmony with the environment in our dear Fuerteventura. The South of our dear Fuerteventura is strongly committed to water tourism. The extension of Morro Jable marina —municipality of Pájara—has already been given green light and it have will have 290 berths, which will mean an increase of water tourism and boat trips, thus bringing the passion for the sea, which many of us share, to more and more people. It can’t be denied that we live in a place which enjoys unbeatable conditions for the practice of water sports, and the Government of the Canary Islands doesn’t remain on the fringes of this reality. The estimated investment in the works for the expansion of Morro Jable Marina is close to 8.5 million euros, aiming to promote water and sport tourism on our coastline, thus increasing the number of sport berths — allowing the mooring of up to 35 metre long sport boats— while boosting employment, as 12 new jobs will be created for the neighbours from Pájara. The project, already submitted last week, has been called “Marina Jandia” and, after the award of Canarian Ports — whose aim is to supply social and economic profitability to the 36 ports in the island— it will be built and exploited for 25 years by a company from Lanzarote, Puerto Calero S.L., which will create a recreation site that will meet all the necessary requirements to turn the passion for the sea into an unforgettable experience. Berths will increase and an area of commercial activity will be boosted, 2000 m2 out of the total 64.180 m2 being devoted to the setting up of 20 commercial premises. This way, not only the development of sport and tourist services will be allowed, but also this southern marina will be totally restored. According to José Calero, Chief executive officer of Calero Marinas, one of the main aims of these works is to attract to the Canary Islands the 850 super yachts that cross the Atlantic to the North of Alegranza every year without stopping in the Islands. This is why we are working in projects like this one in The Canary Islands. Here in Morro Jable we have the best and cleanest beaches as well as the sun; we will also have now first class facilities”. The project has looked for the cooperation by Cruz Roja, the fishermen’s cooperative Morro Jable and The Yacht Club Península de Jandia, in order to promote the smooth running of the marina; and every effort works in the same direction, as even the Town Hall is working in this project in order to join the town centre of Morro Jable to the Marina, and thus increase the number of visitors to the new facilities. The works are meant to start in 15 months, when the works in Arrecife Marina, which are being carried out by the same company Puerto Calero S.L., are supposed to be over. With actions of this kind, Fuerteventura keeps growing towards a quality tourist future, with facilities that will allow us to make the best of our boat trips, so as to show our visitors the charms of this island from the sea. • The importance of this town after having been used as cinema set in the shooting of “Exodus” and “The Dictator” has been highlighted. Corralejo Grandes Playas and the rest of La Oliva have started their tourist promotion this week in the International Tourist Fair in Madrid (Fitur), highlighting the recent award by Tripadvisor, which certifies that the tourist area in the North of Fuerteventura is the most important emergent tourist destination in Europe and the 9th in the world. An award won thanks to the opinions and scoring by TripAdvisor users, one of the most important tourist portals in the continent. The Mayoress in La Oliva, Claudina Morales, and the Councillor of Tourism, Marcelino Umpiérrez, attended the inauguration of the fair in Madrid, the most important in Spain, and the third most important in Europe along with London and Berlin, aiming to deepen in the promotion of this town among the tour operators in the Peninsula. The symptoms of recovery regarding peninsular tourism registered in the last quarter of 2013 could extend to the year 2014, according to the forecast by the tourism management in Madrid. Moreover, Corralejo Grandes Playas inaugurates its own display in the so called pink corner, where some of the destinations and companies supporting the LGBT sector (Lesbians, Gays, Bisexuals and Transsexuals) gather. This initiative places Corralejo next to two already consolidated destinations in this sector, which will allow the specialised press to get to know the tourist area in the North of the Island even better, and its attractions for the LGBT community. We must highlight the efforts by Fuerteventura and Corralejo to promote as a tolerant and “gayfriendly” destination. We will also remark the presentation of the poster for the next “Rainbow Fuerteventura”, which will be celebrated from the 4th to the 8th of December. The increasing importance of this town after being used as a film set after the shooting of “Exodus”, by Ridley Scott, the American film “The dictator” or “Invasor”, the last production by the director Daniel Calparsoro has also been highlighted. Another interesting proposal in Fuerteventura are the boat trips in Corralejo, and Fuertecharter has also done its bit to get this award by Tripadvisor, as we are the first attraction in The Canary Islands, something we feel proud of. With our trips in Fuerteventura, the boat trips and boat chartering we contribute to letting the tourists find out the wonders in the Northern area which has been so promoted and that visitors like so much, thus getting customer loyalty.